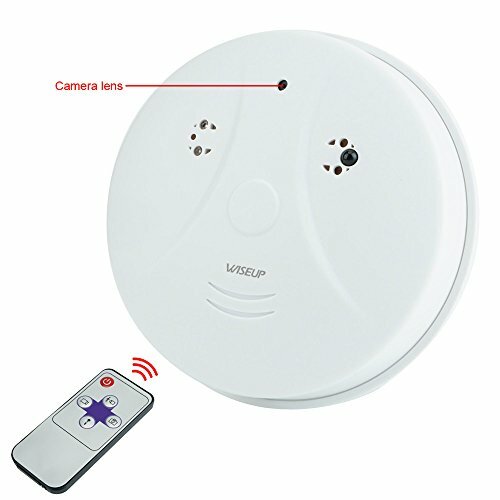 This hidden camera looks like a standard sized smoke detector but it is packed with a high resolution, wide angle DVR. The camera records color video up to 30 fps. The detector is also equipped with an internal Li ion rechargeable battery and 8GB of internal memory. Note: it's not a real smoke detector, just look like it. If for any reason you are unhappy with any product by Wiseup, please do not hesitate to contact us. We take full ownership and responsibility for the quality of our products and will do our best to solve your problem quickly and efficiently! Wiseup is a registered trademark protected by Trademark Law. Wiseup products are sold by authorized selles only. 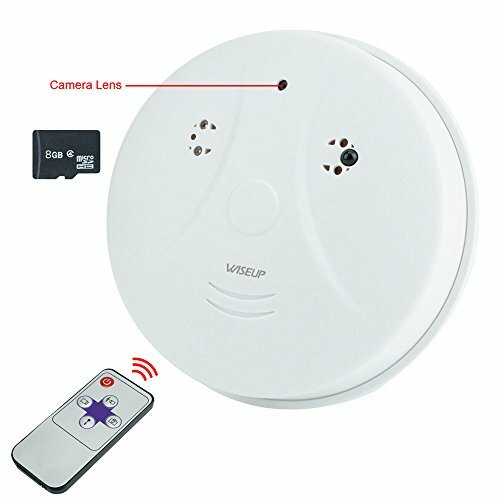 ?SPY CAMERA?It is an indoor covert smoke detector, supports 1280x1024 image display, allowing users to have clear and sharp monitoring pictures. It is suitable for places like shops, banks, stadiums, factories, warehouses. ?AUDIO CAMERA?This camera has functions of real-time AV recording, motion detective recording, remote control. The camera records color video up to 30 fps. ?VIDEO CAMERA?Max video resolution can reach (1280*720), real-time image; minimum illumination,20 Lux,H.264 main profile compression, achieve low bit-rate, high definition image quality. ?MOTION DETECTION?When motion is detected, the camera will start recording automatically. This camera will faithfully record your uninvited guest's action and can act as proof provider for further use when there is any accident. ?MEMORY STORAGE?8GB Micro SD Card built-in to provide enough capacity,the camera supports 32GB Micro SD Card in Max (32GB SD Card not included).